Lot 1528, Aurora Gold, sells to Bertrand le Metayer for 550,000 guineas ($734,969) at the Tattersalls December Mares Sale. 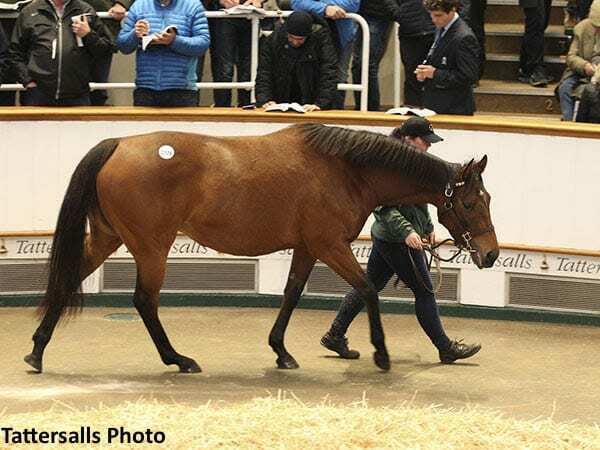 The Tattersalls December Mare Sale got off to a strong start with international buyers the feature of the opening day. Three mares from Prince Khalid Abdulah's Juddmonte Farms led the way during a session that saw 215 lots realize 12,310,200 guineas (US$16,449,833) at an average of 57,257 guineas ($76,515) and a median of 30,000 guineas ($40,090). Leading the way was Aurora Gold, the Frankel half-sister to the champion mare Midday who was knocked down to Bertrand le Metayer for 550,000 guineas ($734,970). The 4-year-old Juddmonte Farms consigned mare, offered in foal to Kingman, caught the attention of Blackstone Farm's Christian Black, Rabbah Bloodstock's Jono Mills and Barronstown Stud's David Nagle but none could match Le Metayer. “She is for a new French breeder,” said Le Metayer, “who wanted to get involved in this family. “The mare is scopey and in-foal to Kingman – with him, and Kingmambo as her broodmare sire, it should offer some size to this foal. Aurora Gold's other siblings include the Group 3 Nell Gwyn winner Hot Snap, the Group 2 Ribblesdale Stakes winner Sun Maiden and the listed winner Midsummer Sun, whilst Midday is also the dam of the group & listed winners Midterm and Mori. Two lots earlier Michael Youngs went to 425,000 guineas ($567,947) to secure the listed placed mare Argumentative on behalf of Jane Lyon's Summer Wind Farm. The daughter of Observatory is already the dam of G1 Criterium de Saint-Cloud winner Epicuris and was offered in foal to sire-sensation Frankel. The third of the triumvirate of high-profile Juddmonte consigned mares was the Dansili 3-year-old Fine Time who was also offered in foal to Kingman. The daughter of the Sadler's Wells mare Clepsydra is a sister to the G1 winners Timepiece and Passage of Time and was knocked down to Stroud Coleman's Matt Coleman for 420,000 guineas ($561,274) on behalf of Noel O'Callaghan's Mountarmstrong Stud. Coleman secured the filly, who is also a sibling to G3 winner Father Time and listed winner Continuum, after staving off the efforts of Camas Park Stud's Timmy Hyde and Rabbah Bloodstock's Jono Mills. Late in the evening Camas Park Stud's Timmy Hyde Snr secured the ten-year-old mare Bristol Bay for 400,000 guineas ($534,544) after a prolonged bidding battle with owner-breeder Stuart Stuckey. The daughter of Montjeu, who was consigned from Ballylinch Stud, is the dam of the listed winning, group-placed four-year-old Bay of Poets and was offered in foal to Lope de Vega. “She is a lovely mare and very well covered,” said Hyde. “We'll know if we have made the right decision here tonight when we get the foal! Bristol Bay was bred by Gestut Ammerland and is from a pedigree long developed by the farm which includes the champion filly Borgia and the G1 Coronation Cup winner Boreal. Paul Hensey, representing Chinese operation Rifa Mustang, secured G2 Park Hill Stakes winner The Miniver Rose. The 12-year-old mare, who was offered in foal to Dubawi, was consigned by Godolphin and knocked down to Hensey for 300,000 guineas ($400,908). The Miniver Rose is a half-sister to Belle de Crecy, winner of the G2 Blandford Stakes and placed in the G1 British Champion Fillies/Mare Stakes. The Tattersalls December Sale continues Tuesday, Dec. 4. This entry was posted in Bloodstock and tagged Argumentative, Aurora Gold, ballylinch stud, Bertrand le Metayer, Bristol Bay, Fine Time, Godolphin, horse auctions, Jane Lyon, Juddmonte Farms, kingman, Matt Coleman, Michael Youngs, Mountarmstrong Stud, Noel O'Callaghan, Paul Hensey, Rifa Mustang, Stroud Coleman, Summer Wind Farm, Tattersalls, Tattersalls December Mares Sale, The Miniver Rose, Timmy Hyde Sr. by Edited Press Release. Bookmark the permalink.